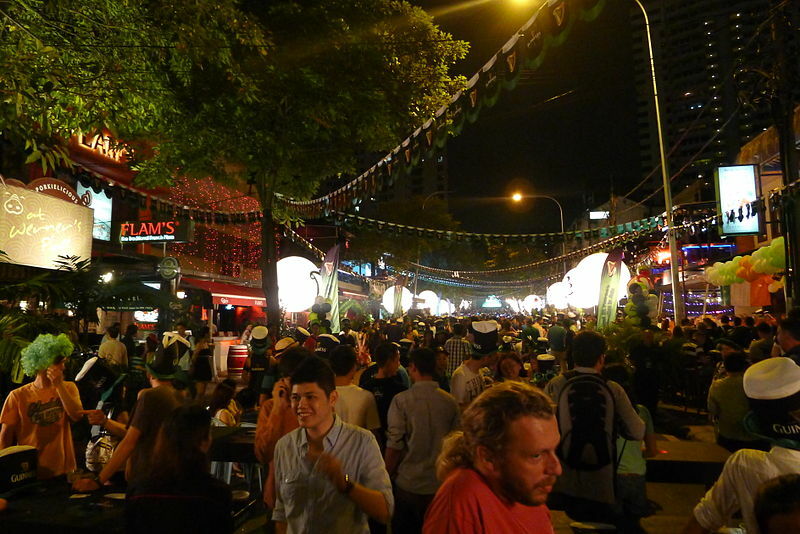 If you are a party animal and looking for a place to party in Malaysia, the place to be is Changkat Bukit Bintang. The streets here are full of bars and nightclubs, and several restaurants to satisfy your hunger. Stop by a few of these places to let loose and have some fun. The Hollywood style bar is carpeted in red at the entrance giving it somewhat of a luxurious air about it. Enjoy your favourite drinks with many promotions that go on through the night. The happy hour here is from 5 pm to 9 pm and what’s more, get two-for-one promos on martinis. Ladies enter free every Friday; music and the dance floor is active all night long with some of the best DJs in town. Famous for its pork delicacies served in large portions, you may also come across pasta, seafood, lamb and poultry dishes on the menu. A glance at the restaurant’s wine menu will leave you with a wide choice of affordable wines; Australian Sauvignon and Chilean Chardonnay are two popular wines. A bottle of wine costs less than RM 200 while a glass of wine may cost RM 17. These wines are imported from France. Australia and New Zealand. The pub which is English-inspired has many fitted LED television screens around so that sports fans can come watch the live games while enjoying a snack and a drink here. The food menu includes western food like hamburgers, pasta and various pork dishes. The menu for drinks is great too with cocktails like Somersby and so on. Moreover, enjoy special promotions all day long. Be it enjoying a drink or indulging in delicious food, Ceylon bar has it all. Authentic Sri Lankan dishes are served here along with savoury BBQ and pork ribs which are served quite generously. Sit back while you watch a football match and take in the ambience around with a drink in hand. Try beverages like Ceylon Iced Tea and Snowball. If you are holidaying in Berjaya Times Square Hotel perhaps, or any hotel in Kuala Lumpur does hop in for a groovy time. Previous Post Facts about the Kalutara Bridge – A major link between Sri Lanka’s Western and Southern borders! Next Post Why the London Eye Was Built – The millennial monument!